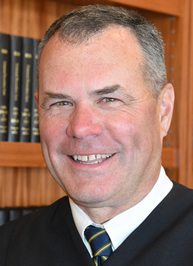 Justice John C. Egan Jr. Appointed to the Third Department effective February 4, 2010. Graduated from Bryant College in 1976. Graduated from Albany Law School in 1980. Admitted to the practice of law in 1981. Engaged in private practice from 1981 to 1996. Served as an Assistant Corporation Counsel for the City of Albany from 1981 to 1996. Also served as part-time law clerk in Albany County Surrogate's Court. Served as Counsel, Third Department Judicial Screening Committee. Elected Albany City Court Judge in 1996. Elected Supreme Court Justice for the Third Judicial District in 2005.